Café Calabria, Vancouver’s oldest Italian coffee shop, and Fratelli, a long-established local Italian bakery, are gearing up for Italian Day on Commercial Drive, which will involve revelling in good food, coffee and family. A highlight of Italian Heritage Month, the Italian Day street festival takes place on June 14 and will celebrate the contributions made to Vancouver by Italian immigrants and their descendants. “People still say the size is too small,“ says Café Calabria owner Frank Murdocco, 70, referring to the size of the cup. For Murdocco, true espresso is a single shot served in a small cup without any sugar or cream and bitter to the taste. Born in Calabria, Italy – hence the name of his café – Murdocco moved to Montreal when he was nine years old. “You can’t take the Italian out of me; I have an accent. I’m Italian all the way but became Canadian because I live here,” he says. Murdocco tries to cater to everyone’s taste. “If you don’t like what you see, we can make you what you want—we want to make everyone happy,” says Murdocco. Coffee shops on Commercial Drive in the 1960s and 1970s had a distinctive culture, says Vince Murdocco, Frank’s middle son. “It was a gentleman’s club—a kind of place where guys would hang out, play cards, chat, have coffee and then go home or to work,” says Vince Murdocco, 48. Frank opened Café Calabria in 1976 on Vince’s 10th birthday and changed all of that. “My dad didn’t want this taboo of men only – [he] wanted my mom and families there,” says Vince Murdocco. The senior Murdocco says his café doesn’t even have a television screen. “We don’t even watch soccer; 50 guys gonna sit there and scare everyone off,” laughs Frank who was a soccer player himself and does enjoy watching the game. “My father tells it like it is, and for most people, my dad is the closest thing to having a family,” Vince says. Working for his father is tough, Vince adds, but he acknowledges his father’s strong influence on maintaining a positive attitude and family values. “We all take care of each other, and everyone that comes in sees that,” says Vince. 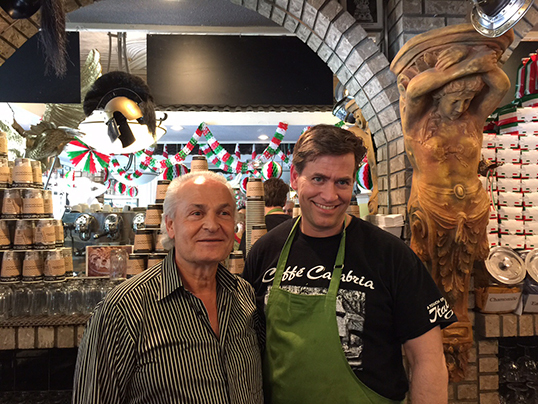 Frank says a visit to Café Calabria is an essential part of Vancouver culture. “If you’re in Vancouver and you don’t visit [the café], it’s like being in Rome and not visiting the Coliseum,” Frank says. The Murdoccos enjoy Italian Day on the Drive and spend most of the day preparing ice coffee and ice cream for customers. 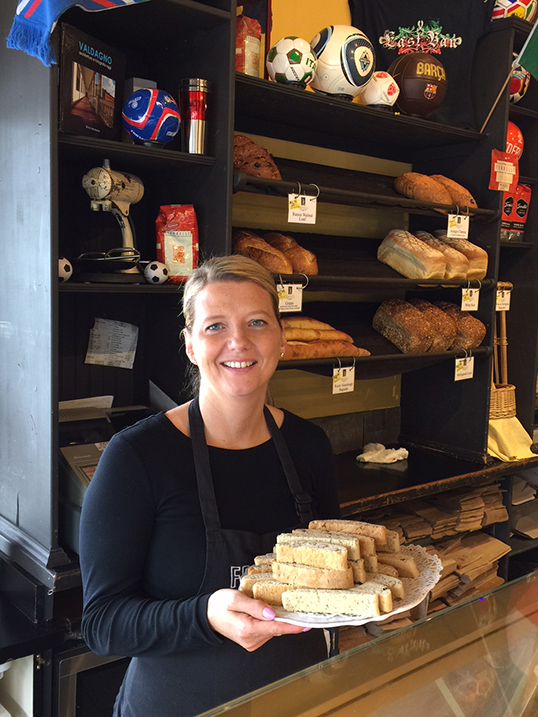 For Lori Hibbert, a manager at Fratelli Bakery, Italian Day brings back fond memories of her childhood. “I grew up always remembering coming here; the crowds, people you see, the authenticity of the Drive and all the different cultures now on the Drive,” says Hibbert. The main stage is located across from the bakery and Hibbert says she can hear the music throughout the day. Hibbert will be busy with customers, selling baked goods and pastries such as biscotti. Biscotti, she says, is basically a ‘double-baked cookie’ made with olive oil and is traditionally lemon-almond flavoured. “My favourites are the cranberry-pistachio and hazelnut-blueberry flavours,” says Hibbert. “The mix is made in the machine but we weigh it out by hand and it’s rolled out by hand. That’s the way we learned it and we’ll keep doing it that way,” says Hibbert. to provide homemade goods for people to enjoy and showing them that we put our heart and soul into it,” says Hibbert.